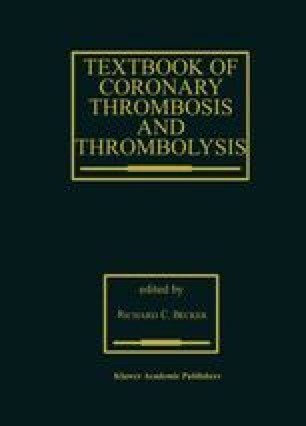 Thrombolytic therapy has become an accepted form of treatment for acute myocardial infarction. The GUSTO I trial showed that mortality reduction correlates with early, complete, and sustained patency of the infarct-related coronary artery ,. Current thrombolytic regimens achieve patency 90 minutes after initiation of treatment in only about 81% of cases, and only about 54% experience complete (TIMI grade 3) reperfusion. These results are obtained 90 minutes after initiation of therapy, and earlier patency rates are even more disappointing. Early reocclusion further limits the preservation of left ventricular function. In addition, even though patients are carefully selected, bleeding, especially intracranial bleeding, is a feared side effect, limiting the applicability of this form of treatment. In order to improve the risk/benefit ratio of thrombolytic therapy for patients, a number of new thrombolytic agents are being developed, primarily with the aim of reducing mortality by establishing more rapid, more complete, and more stable coronary patency.